Have you ever used music to heighten your mood or help you relax? Created a piece of art that symbolized who you are? Empathized with a character on stage or screen? Connected with someone on the dance floor? If so, you were experiencing how the arts can naturally help people develop social and emotional well-being. We can be intentional in creating these kinds of experiences in schools by integrating the arts with social and emotional learning (SEL), which is all about knowing and managing yourself and being able to empathize and interact well with others. The arts are highly engaging and can be naturally embedded in SEL. Integrating the arts to foster SEL strategies into your elementary classroom will create a safe and supportive environment that encourages individuality, a growth mindset, and collaboration. Move and Freeze is an activity in which students explore a variety of movements throughout the classroom. After talking briefly about the shared space and pathways in your room, turn on some instrumental music and ask students to walk, hop, sashay, or skip through the space. To incorporate dance elements, call out instructions for students to vary things like the level at which they’re moving (go high, crouch low), the energy (strong, heavy, light, relaxed, sharp, free), and the pace (quick, upbeat, like a turtle). Finally, incorporate different emotions for students to convey in movement (angry, sad, proud, joyful). Every so often, pause the music and ask your students to freeze in a relaxed pose. They can take a deep breath before you ask them to move again. 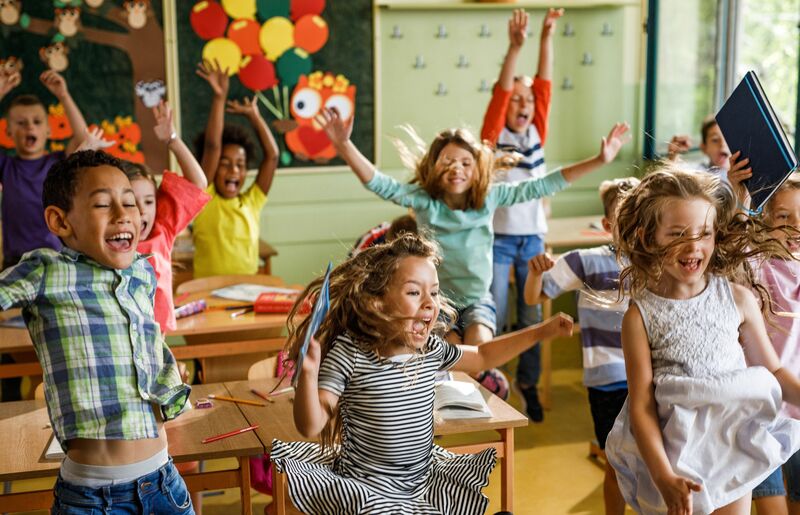 The key to fostering self-awareness with this activity is bringing students’ attention to how their bodies feel as they move and freeze, and how those physical feelings connect to their emotions. For example, students should note how they carry themselves as they move angrily and how that differs from when they move proudly. To help them pay attention to this, call out for them to notice how their bodies feel as they move around the room. You can have them call out adjectives that describe how they feel or have them hold on to their thoughts for a journal entry later. Playing music in the classroom is an everyday strategy that is beneficial for both teachers and students. The right kind of music can help regulate the mood and energy in the room. Yoga or alpha wave–type music works best for this as it is non-rhythmic and creates an atmosphere that is conducive to calm and focus. To begin, explain to your students that you plan to play music that will help them focus. Some students may pay attention to the music for a while, but eventually it will become a background sound, allowing everyone in the room to work peacefully. I use this every day in my fourth grade classroom during both instructional time and quiet working time. My students appreciate the tranquil atmosphere the music creates in the room—when I forget to put the music on, they ask for it. Drama is a natural way to practice social awareness because it allows someone to walk in another’s shoes. Teachers can set up short improvisational skits using character cards to help initiate student discussions about how they or their peers might feel in a certain situation. The scenarios generally fit on an index card. Put yourself in John’s shoes: John is a 9-year-old who comes to school with a smile on his face, but his clothes are always dirty. A couple of girls were joking around at lunchtime one day, noticing that John had been wearing the same sweatshirt all week. With this drama-integrated activity, students develop empathy for others as they discuss the character card and practice and then perform short skits. Encourage students to discuss and develop their character before attempting to portray him or her. They should use body language, facial expressions, and simple props to help bring the character to life. You can extend this activity by having students pause and break the fourth wall by saying what their character is thinking at various points in the situation. Allowing for 20 to 40 minutes every so often to do activities like these can really prove beneficial. Best of all, you can get started right away implementing these arts-integrated strategies in your classroom.